It’s that time of year when the Fremont Police and Fremont Fire Departments face off at the Battle of the Badges. 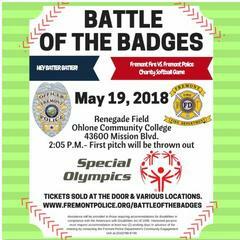 The charity event will benefit the Special Olympics Northern California, and will take place at Ohlone Community College softball field on May 19, 2018. This special event is open to the general public and we encourage our community to come and help support Fremont’s public safety departments! The event will open at 1:05 pm. The opening ceremony followed by the 1st pitch will take place at 2:05 before the main event. In addition to the exciting softball game, the event will feature between innings entertainment, raffle prizes, a traditional 50/50 raffle, and an exclusive event geofilter for those photo opportunities. Let’s not forget to mention the food which will be prepared by Alameda County Sheriff’s BBQ team along with additional concessions which will be available. All proceeds from the event will be given directly to Special Olympics Northern California to support the more than 300 athletes in the Tri-City area. Special Olympics programs help promote dignity, acceptance, and give people with intellectual disabilities a chance to fulfill their human potential. This special fundraiser was originally founded by the Leadership Fremont Class of 2007, an annual program of the Fremont Chamber of Commerce. Learn more about Special Olympics of Northern California. Fremont Police Department (2000 Stevenson Blvd. ), Mon - Fri, 6:00 am – 6:00 pm. Fremont Fire Admin. (3300 Capitol Ave, Bldg. A), Mon – Fri, 8:00 am – 5:00 pm. If you are interested in sponsorship opportunities, please contact Eva Young.